Mix together the mayonnaise, wasabi paste, five-spice powder, and 1 tablespoon soy sauce in a small bowl. 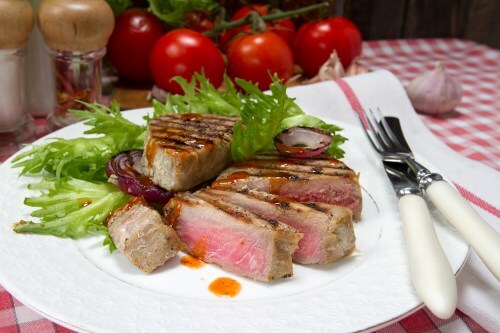 Lay the tuna fillets into a glass baking dish. Pour the rice vinegar and 1 tablespoon soy sauce over the tuna. Spread the mayonnaise mixture evenly over both sides of each piece of fish. Cover the dish and refrigerate 15 to 30 minutes. Prepare a skillet with cooking spray and place over medium-high heat. Sprinkle the sesame seeds evenly over both sides of the fillets. Lay the tuna gently into the skillet. Grill to desired level of doneness, about 2 minutes per side for medium-rare. Serve immediately.